My new book, "The Devil in DC: Winning Back the Country From the Beast in Washington"... ready for pre-order on Amazon now! Listen to what Michael Savage said about it on his nationally syndicated radio show -- a full 40-second spot, where he talks about Devil in DC and recommends reading it. Interested? I am really excited about this book. Each chapter gives a recommendation on how patriotic and Christian Americans can take back the nation from the atheists and progressives that are working to destroy it. First and foremost: Confess, repent and pray. Next up? One chapter, called "Charity Keeps Us Free," describes the best way to make -- and keep -- government subservient, or even irrelevant. Another chapter, "Be Bold: We Are Bosses of Presidents, Politicians and Police," reminds of the proper role of government in our republic -- and how we, the employers, can take back the reins of leadership. And yet another chapter, "Get in the Battle of Principalities," underscores just how useless it is to rely on the newest "R" or "D" in office (Republican versus Democrat) and how we can most effectively fight for control of our nation's politics and culture. Check out this link to learn more ... or better yet, buy the book and learn how to get in the game and recapture the heart and soul of this great country of ours! "Cheryl Chumley's Devil in DC hits the nail on the head of what's wrong with America and then tells how to fix it. She gives clear, concise directions on how to win back the country from the progressives and atheists who've taken over, reminding readers with a most inspiring message: All is not lost, God's still in charge, and the Constitution remains the rule of law." "The Devil in DC: How to Win Back the Country From the Beast in Washington is a superb guide to making our country once again what it was and should be a bastion of freedom and it comes right when it is needed more than ever. The clash of civilizations is only going to get worse, the global jihad is on the march, and we have to sweep out the appeasers and traitors in Washington to make room once again for patriots and lovers of freedom. Cheryl Chumley, in this eye-opening guide, shows how to do just that." 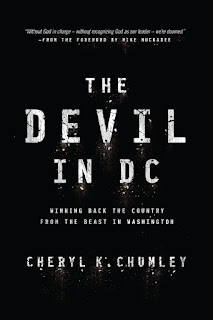 "In Devil in DC, Cheryl boldly mixes religion, politics and the history of our founding to blast past partisan politics and show how patriotic Americans can win this great country back from those who seek to destroy it." "The Devil in DC is such an important book to read. [It] takes the fight of patriotic Americans to an even higher level, appealing to Christians and those of faith to get in the ring, jump in the fight. And what I really like about this book is it then shows them just how to do it." I wrote The Devil in DC as a sort of Part Two to my first book, "Police State USA: How Orwell's Nightmare Is Becoming Our Reality," linked here. Basically: Police State USA points out the problems; now The Devil in DC gives the solutions. It's my hope both these books provide tools to take back this country -- to silence the forces of wickedness that have been gaining inroads in recent decades and weakening the spirit of America. Cheryl, Splendid book. I had a little bit of trouble with Chapter One. I am a Conservative who is also a Republican - the Party does frequently get blamed for the sins of it's errant members. However, with that said, I am purchasing books to send to elected officials and others who need to hear this message. Well Done - keep up the good work! Appreciate the feedback ... and your efforts to spread the news. Thank you! And God bless, you and yours.